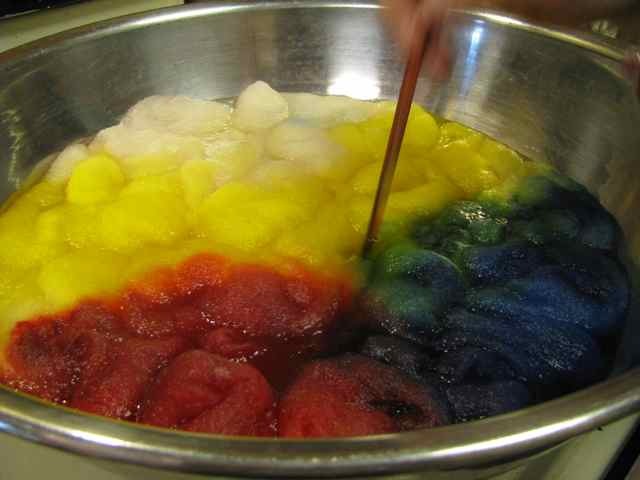 we have the dye pot, some water, and some vinegar…..which makes delicious hot roving soup! 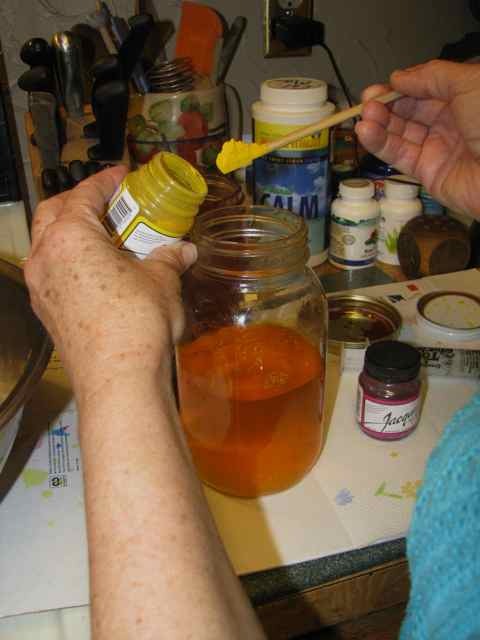 Now we mix the dyes. We used Jacquard acid dyes. Mix the powder with water in a jar according to package directions. Remember your color wheel from high school art class? It still works! We used our primary colors yellow, red and blue. A large syringe and a chopstick work perfectly! 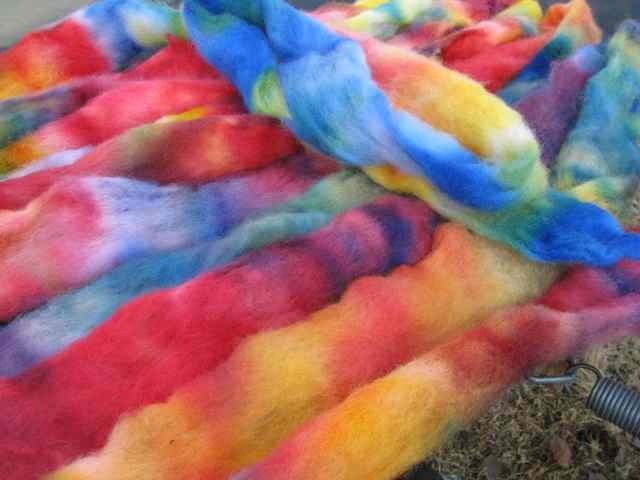 With more high-tech tools such as a chopstick and syringe, add the dye and work it into the layers of roving by poking at them with the chopstick. You can also create additional colors by blending where the colors meet each other. Simply use the chopstick to move the roving a bit, adding more of whatever primary color you want to that area with the syringe. Stir a bit, and voila! new colors. 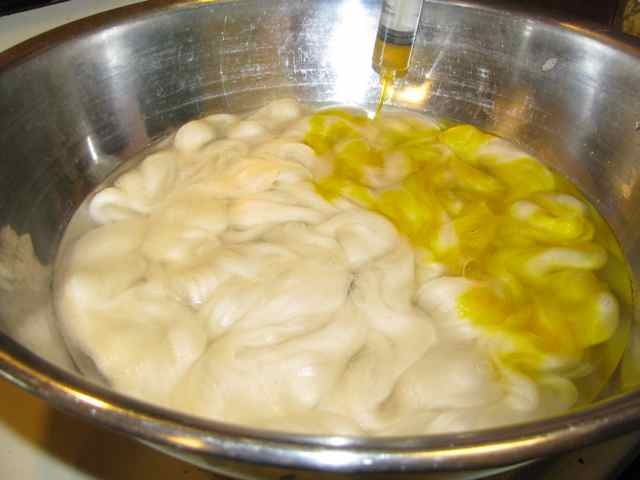 Let the roving soup sit on the stove until all the dye is absorbed into the roving. Like all things good, it takes a little doing before you’re going to feel like you’ve got it! 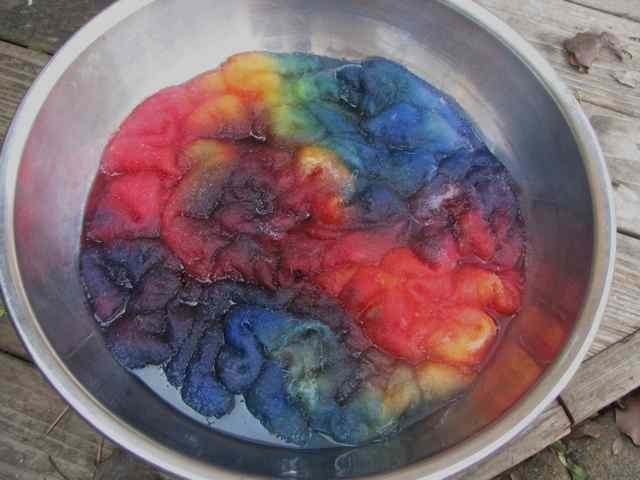 Take the dyepot off the heat and let it cool down naturally. 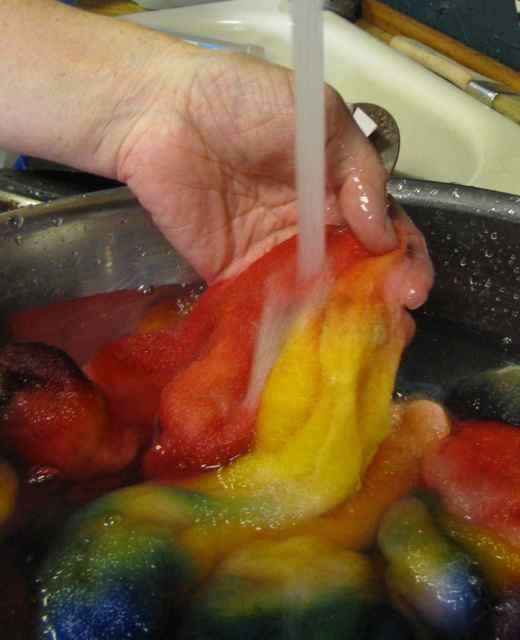 Once you can put your hands into the water, then rinse the roving a few times with the same temperature of water. 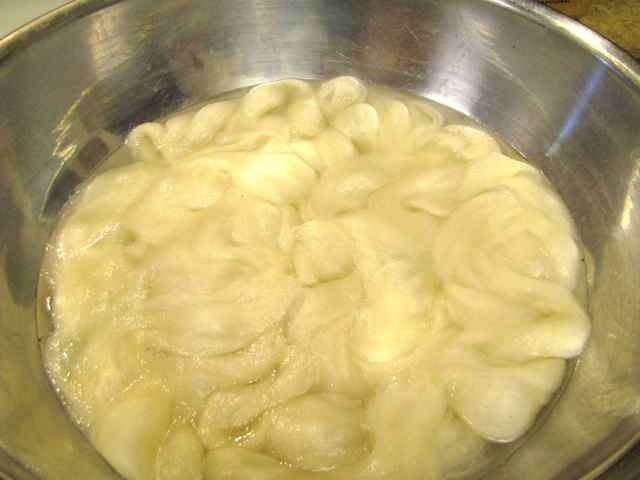 You are rinsing out any unabsorbed dye, and the vinegar. Cooling and rinsing the roving is a S L O W process, and you should not be eager to hurry it up, or you can end up “shocking” the wool into felt! 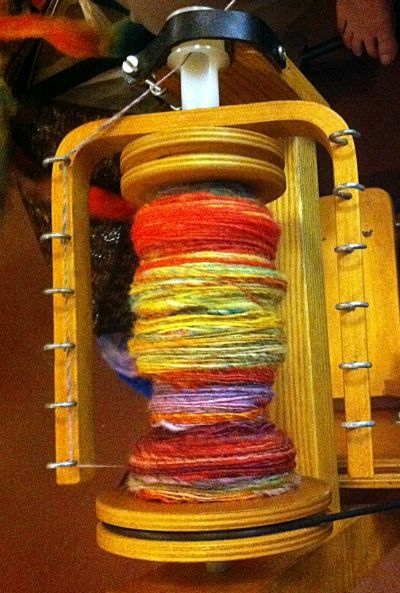 Once the roving is very cool, you can put it in the spin cycle of your washer (on cold!) 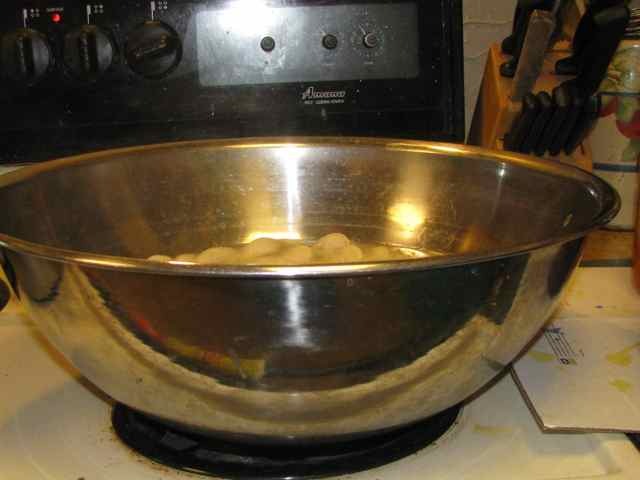 to remove excess water. Then air dry. Ahhh! I get it! 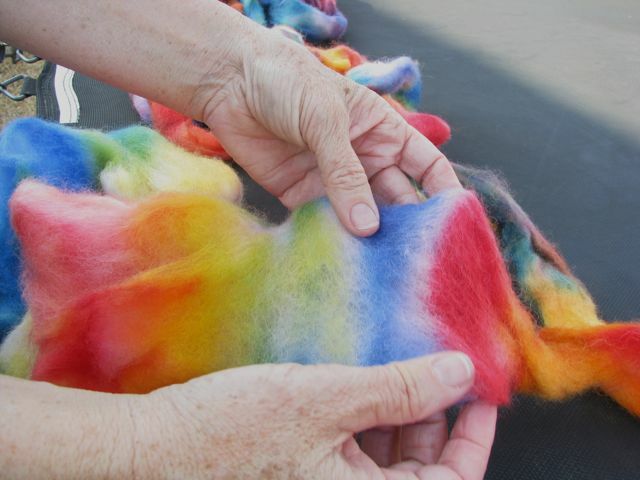 Dyeing the wool before it is spun (i.e., dyed-in-the-wool) is the best way to ensure the color doesn’t fade once the wool is spun into yarn or thread, and then fashioned into a garment worn around town. The literal meaning of the phrase is simply a description of when the dye is added. I have been anxious to get my hands into the dye pot, and finally had opportunity at Arabella’s. She had received a 3-lb bump of lovely Corriedale, and shared a generous portion with me as a birthday present. 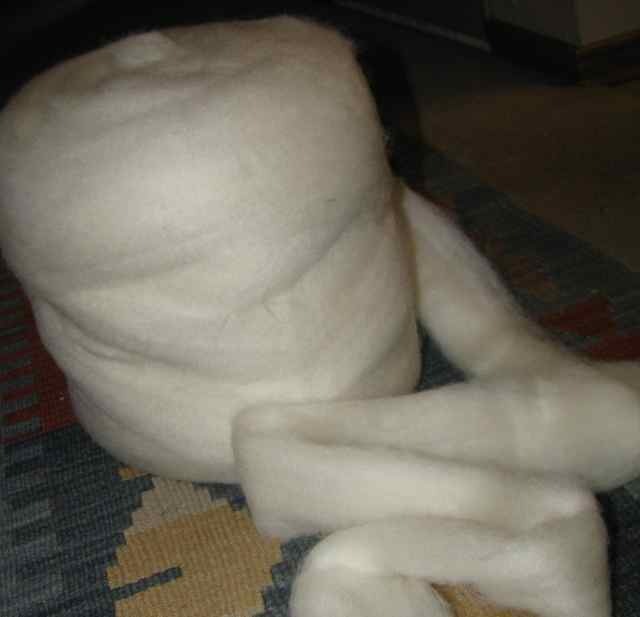 A “bump” is simply a bunch of roving, usually 1 to 3 pounds in weight. 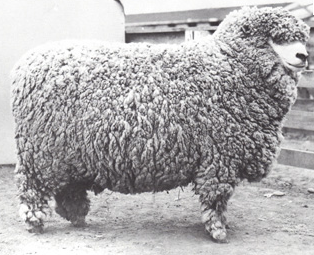 Here is what our lovely and generous sheep might have looked like when the wool was still a part of him! 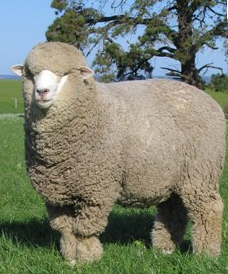 Gorgeous and generous sheep! 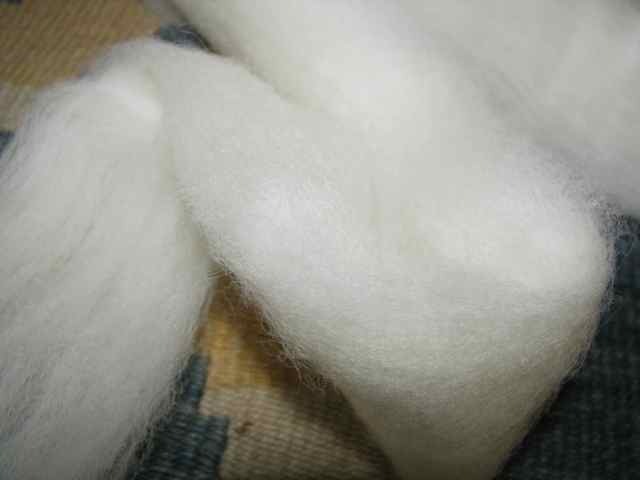 They have been supplying us with fiber for our clothes, blankets, coverlets, coats and carpets for centuries!